The Top 5 Beachranking of the beaches in Hawaii from BeachUSA.info lists the 5 best beaches at the hawaiian islands. Every year, we create a ranking of the best beaches in Hawaii. The winner of the 2011 Beach Ranking is the beach at the Kailua Beach Park at the island of Oahu. For the third time in a row, Americas Best Beach is located in Hawaii. Kailua Beach Park is situated at the southeastern coast of Oahu. 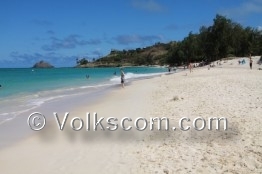 From Honolulu, it is just a short drive to get to the leveled beach at the Kailua Beach Park. The blue ocean water has a pleasant temperature and nice waves. (ranked: America’s Best Beach 2011). In 2009, Waikiki Beach was the number one beach of our Beachranking. Waikiki Beach is probably the most visited beach of Hawaii. The beach at Waikiki Beach is a real dreambeach with some palm trees. The blue ocean water has a pleasant temperature and tiny waves. 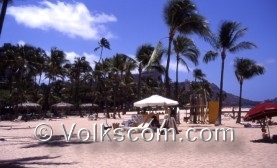 In 2010 and 2011, Waikiki Beach became an other good position at our annual Beachranking. In 2010, Mauis H. A. Baldwin Beach Park was ranked as best beach in America. The Beach at the H. A. Baldwin Beach Park is a popular beach at the island of Maui. 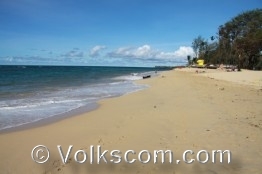 This beach is a beautiful leveled sandy beach. The blue ocean water has a pleasant temperature and nice waves. Oneloa Big Beach is situated at the hawaiian island of Maui. It is one of the most beautiful beaches of Hawaii. Because of the strong waves, it is necessary to be very careful. Oneloa Big Beach achieves the third place at the 2009 Beachranking. 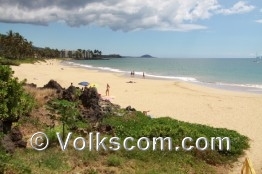 A scenic beach is located at the Charley Young Beach in southern Maui. 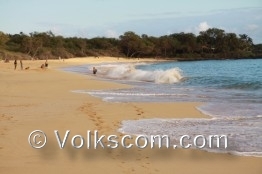 This beach belongs to the best and most popular beaches in Maui.